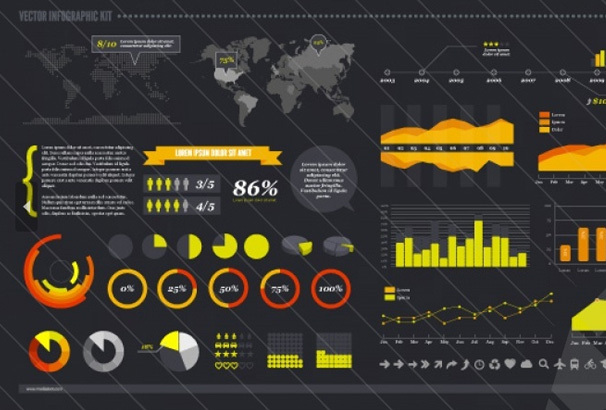 Infographics have exploded in popularity over the past few years as a great way to represent more complex information in an easy to understand and attractive way to view the data and information. You can use them represent data, information, statistics and just about anything else which can be quantified. They have become popular with websites as, due to their visual nature they are easy and popular to share on social media sites and also on other related websites and can be highly successful in generating back links and viral traffic to your site. If you work in an area which uses content marketing to generate traffic to your website, infographics can be a valuable piece of your content strategy. They should not be over-used, but a good infographic when done properly can give you a huge boost in traffic and links to your website which will boost the whole site in search rankings. There is a reason they are so popular and that is because they work! 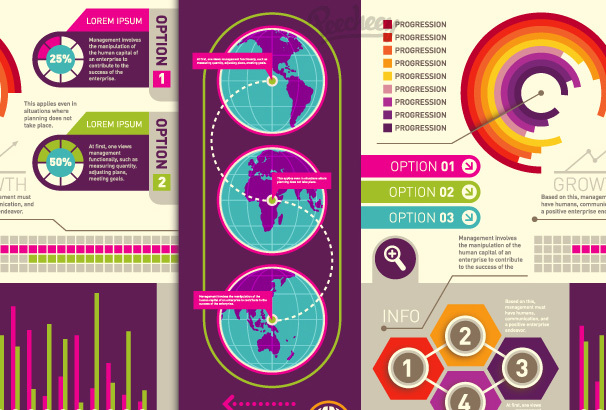 If you are thinking about creating an infographic, you should spend some time carefully planning it out, first of all you need to think of a topic. A good topic is one that is related to your website or business, but also will appeal to a wider audience as well – don’t go “too niche” with it. 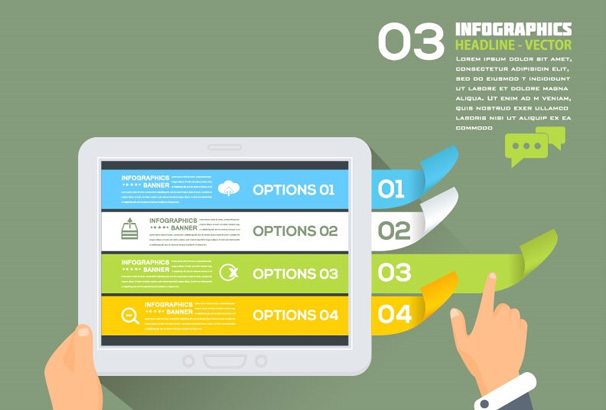 Once you have a theme in mind for your infographic, you need to spend some time researching it and put together a list of information or some statistics to use in it. Then you can begin roughly sketching out your idea and layout – once you are happy with that it’s time to start designing. They are not always easy to create, up till now you would require a designer to create the infographic for you using information that you supply. 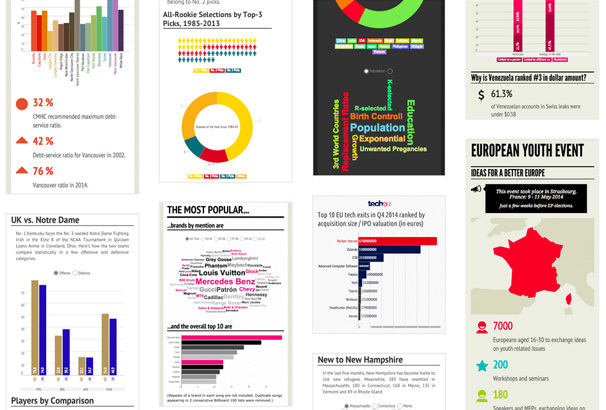 There are now a number of free online tools you can use yourself to create very nice looking infographics, saving you the cost of paying a designer. Once you are happy with your infographic, post it on your blog and make sure you include some code for other people to embed it on their websites easily and make sure the code links back to the page where your infographic is hosted. You can then being reaching out to other sites in your niche and asking them if they could post it for their readers, you can also reach out to influencers on Twitter and ask them to share it with their followers. Finally, their are a number of websites where you can submit your infographic to, so you can obtain even more back links and increase your chance of going viral. We have split this post up into two sections – the first is a number of online generators and the second is a number of assets in PSD and vector format that you can download and use in your program of choice such as Photoshop or Illustrator. 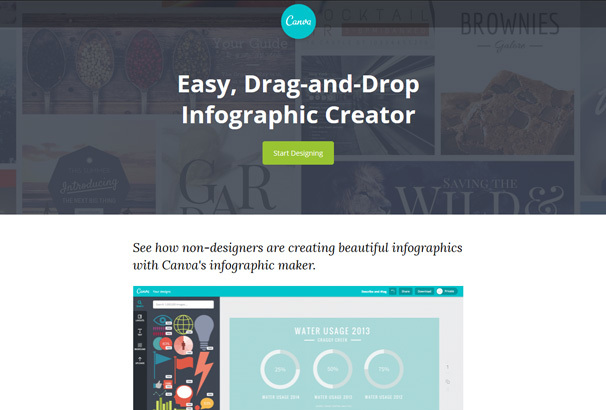 The tools listed in this section are all online services you can use to generate your own infographics using their builders, all have a free component you can use and some also include paid options which will often include more resources you can use. 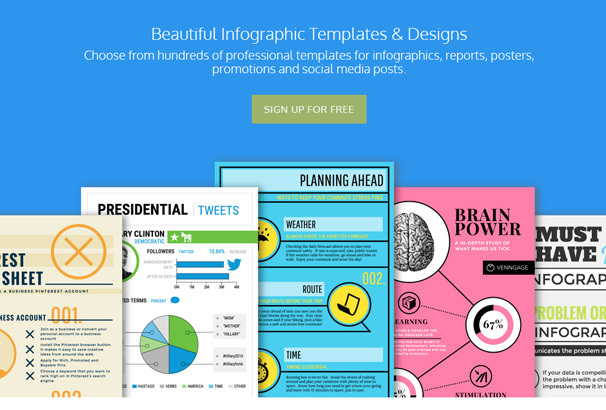 Choose from hundreds of professional templates for creating infographics, reports, posters, promotions and social media posts with the help of this fantastic resource. Fully responsive, it will display brilliantly on all devices from iPhones to desktops. From choosing background colors and images to inserting texts and banners, the premium quality Piktochart editor will empower you to do it all within seconds. 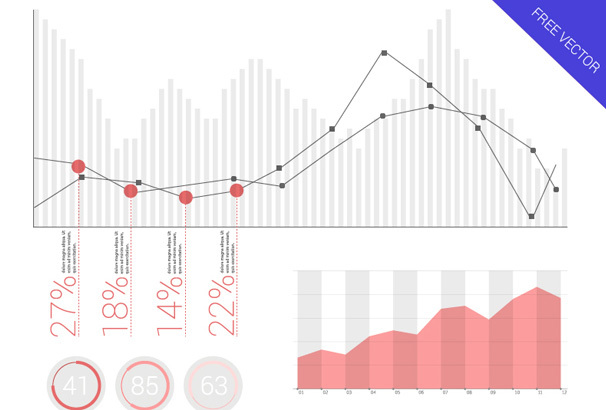 Create and publish beautiful visualizations of your data quickly and easily with a little assistance from this valuable tool. Interactive, responsive and engaging, it will provide you with all you need to create stunning and effective infographics with ease. 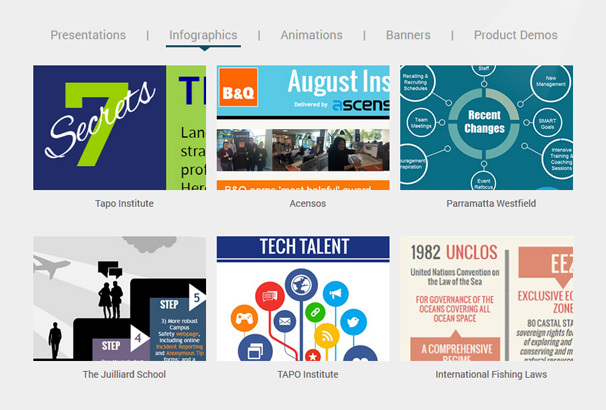 Launched in 2012, Easel.ly has quickly become the go-to site for users who wish to create eye-catching, informative, and fun graphics on the web. 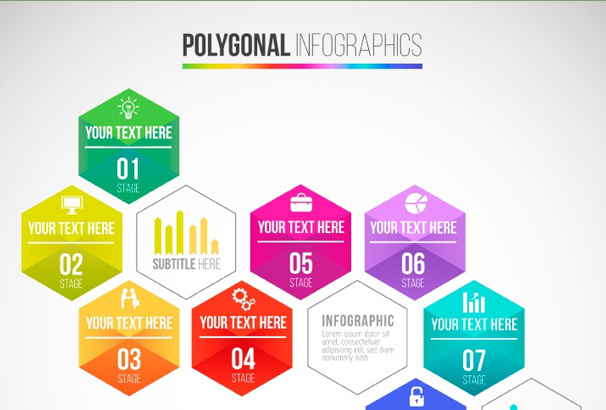 Traditionally, the creation of infographics for statistics, lesson plans, and business presentations took time, money, and graphic design skills, but this amazing online resource has made it possible for absolutely anyone to design their own custom infographic in minutes. The best part? It’s free. 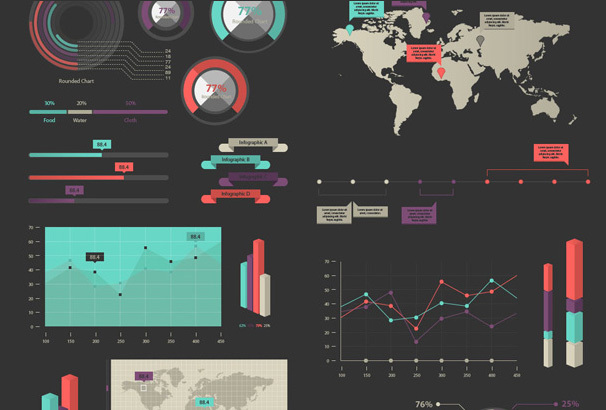 Give yourself the power to create stunning and effective infographics with the help of this premium resource. You won’t need graphic design qualifications to create powerful visuals with a little assistance from this great tool. Visme is the multi-purpose tool you been waiting for to create powerful and effective visual graphics more easily than ever before. 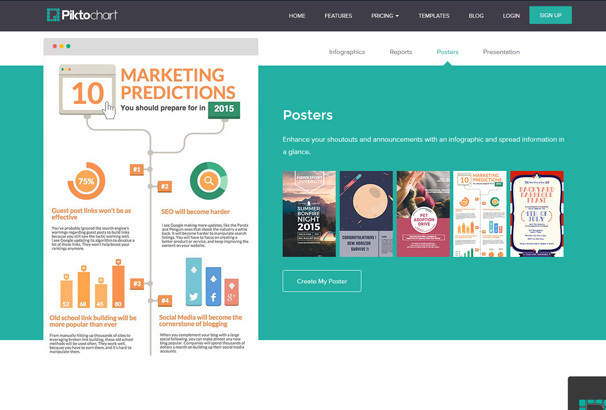 Utilize its many charms to create any type of content including infographics, reports, product demos, presentations, web banners, resumes and more. 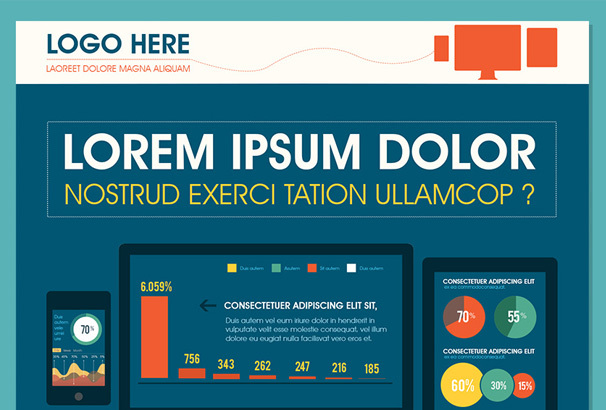 The resources in this section are all downloadable files in PSD and various vector formats that you can use in your own program like Photoshop or Illustrator to put together your infographic that way. 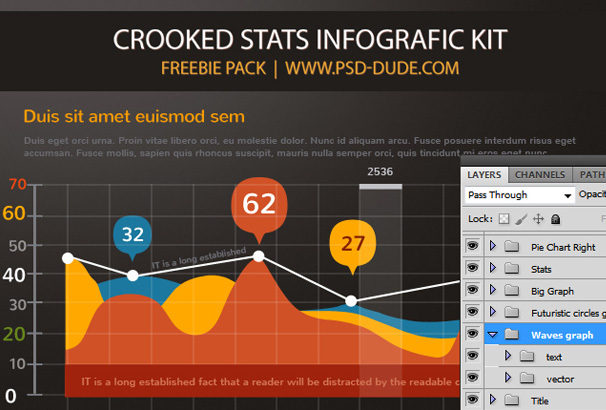 This great free kit is composed of over 50 elements, ranging from graphs and charts to maps and symbols. 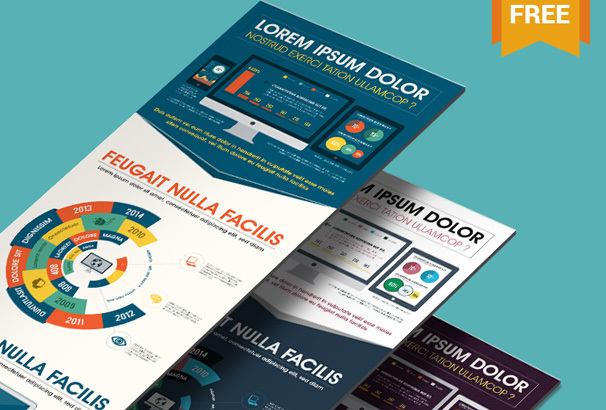 Let your infographic make a stunning impact with the help these bold and beautiful premium quality infographic resources. This high quality vector pack includes both light and dark vector versions as well as all the tools you will need to quickly and easily create fantastic pie charts, graphs, progress bars, icons, steps, location maps and much more. 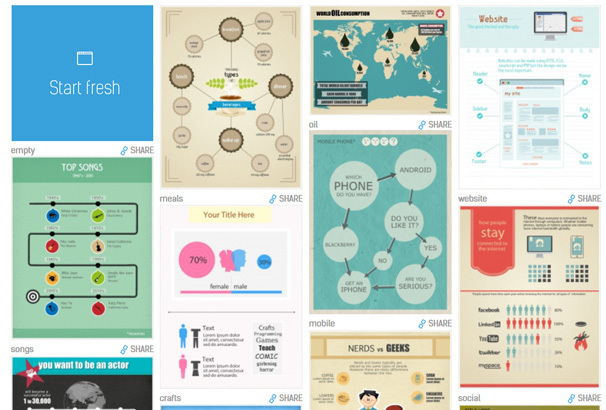 This fantastic resource gives you all the tools you will require to create premium visually powerful infographics with just a few clicks of your mouse. 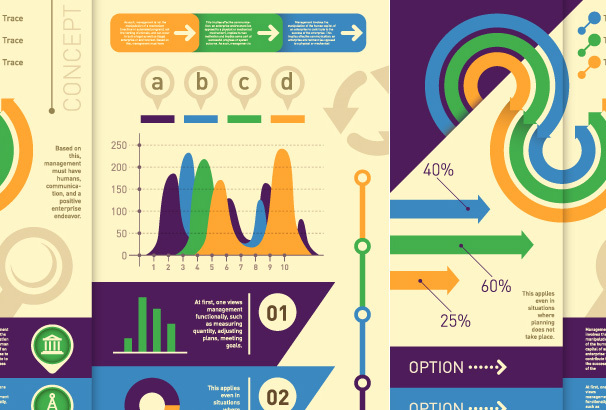 Create stunning and effective infographics in vector format for all of your online presentations and projects with a little assistance from this powerful and visually appealing resource. 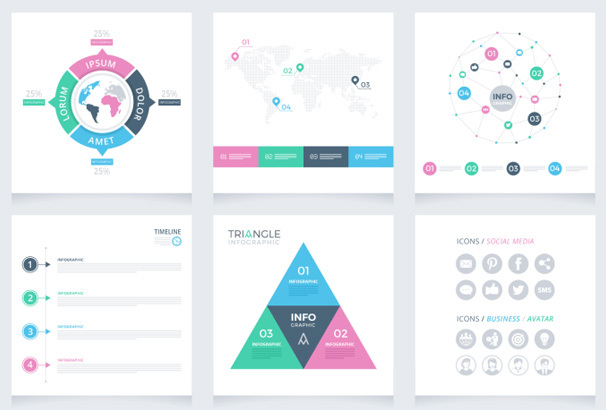 A fascinating free infographic template for all of your technology based business presentations, this free infographic template features crisp, clean lines, icons, info charts, elements and much more. 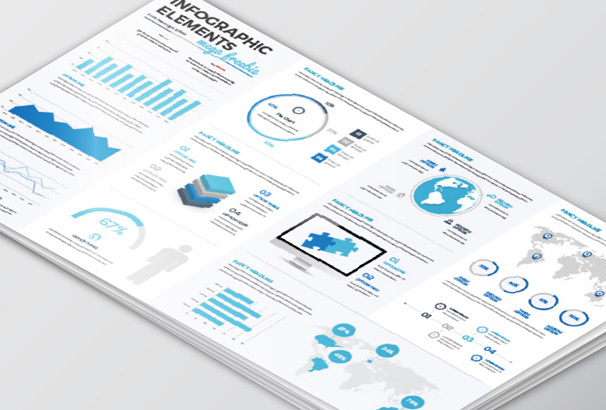 Create effective infographics for all of your business needs with the help of this premium quality template which gives you all the building blocks you need to create maps, human infographics, computer display, pie charts and much more. 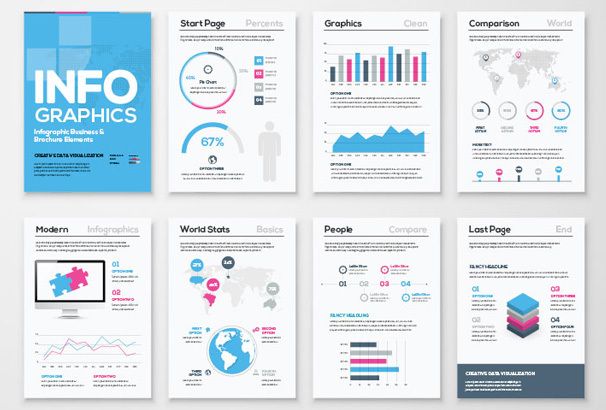 Create stunning infographics for your business with the help of these 10 fantastic free templates. These templates give you the power to create effective and stunning visuals more easily than ever before. 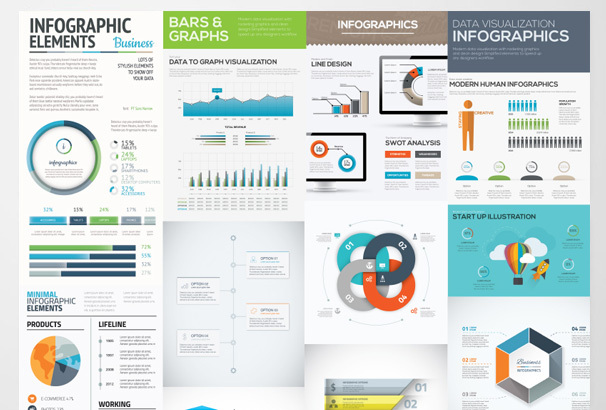 This ultra clean set of templates will enable you to create fantastic infographics for your business with absolute ease. Create graphs, pie charts and much more with just a few clicks of your mouse and the help of these great free resources. 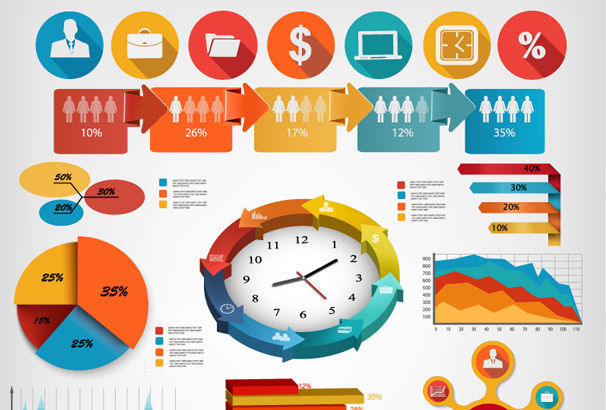 This comprehensive package contains the most used infographic elements such as world map, human infographics, timelines, pie charts, line charts and many others. This quality collection features a sleek white and black background with awesome blue accents. 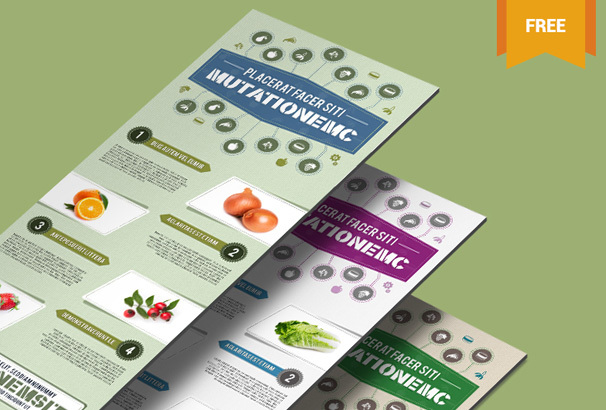 This is a premium quality free template is based on a food and nutrition theme and will give you all the building blocks needed to help you design beautiful infographics quickly and easily. A cool aqua themed infographics template for your personal and commercial projects, this comes complete with lots of elements to enable you to create many different stunning visuals. 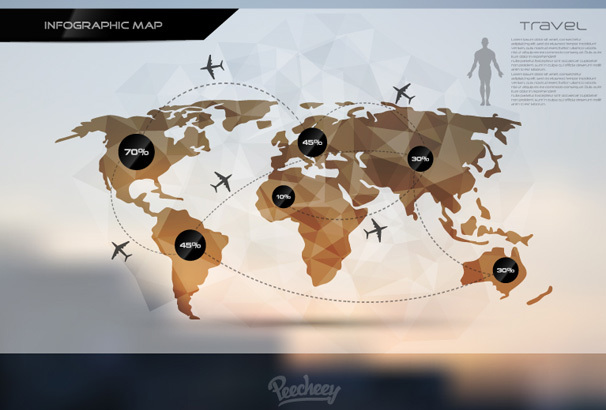 This streamlined travel themed template comes fully equipped with many different elements to enable the simple creation of many different infographic types. Bold colors and an appealing design feature on this high quality medical themed template. 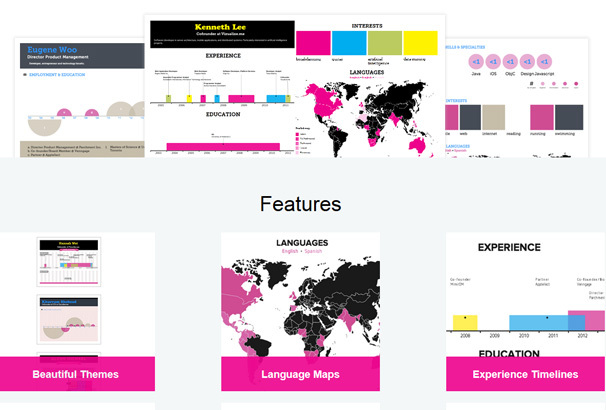 Create multiple premium quality infographics including pie charts, graphs and much more with the help pf this fantastic resource. 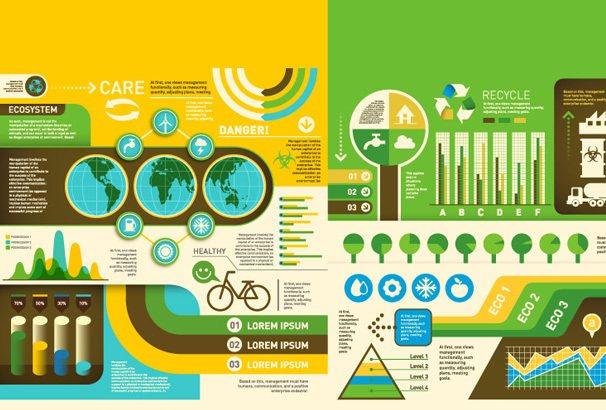 This ecology themed template boasts a contemporary and effective design and all the tools you need to create a wide range of premium infographics for your site. 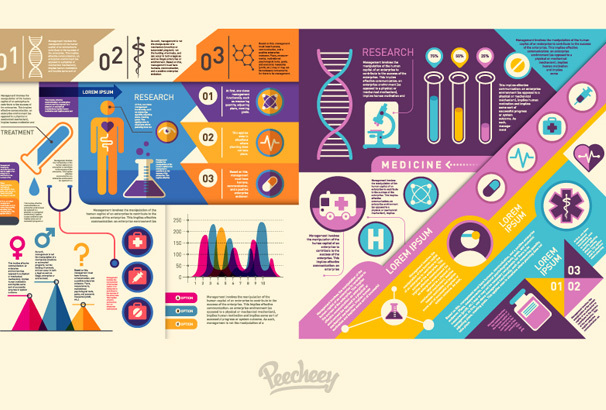 Strong design elements and a distinct retro style combine to make this a very appealing template for the creation of infographics of all descriptions for your business. This will give you all the necessary tools to build super effective and visually stunning infographics of all types with absolute ease. Bold design elements and an understated style add to the appeal of this premium quality set. This ultra modern and minimal vector pack will give you the power to create beautifully powerful infographics with just a few clicks of a mouse. Totally free of charge, it will have broad appeal. Totally free of charge with a simplistic design very well suited to technology based research, this template has a beautiful circular diagram in the middle which can be used to present stats. 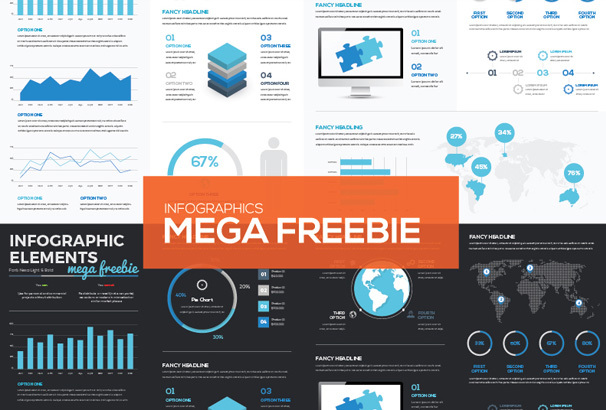 Download this great infographic PSD file absolutely free of charge and begin to create visually impressive and premium quality statistics and data presentations immediately. This contemporary and striking theme has all the building blocks required to help you create bespoke and stunning pie charts, graphs, maps and more quickly and easily. Understated in design, this high quality template will equip you with everything you need to create visually powerful and appealing infographics. 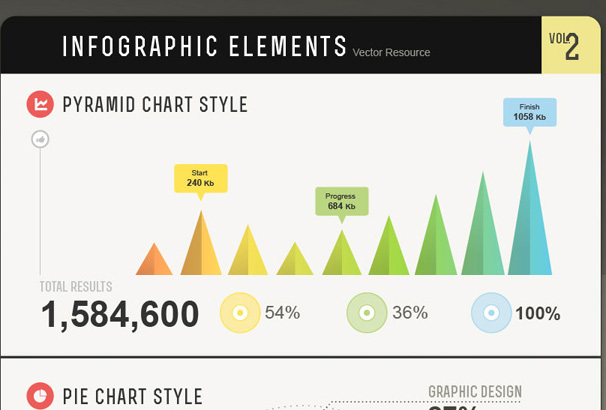 The bold new design of this great resource features a creative pyramid bar chart and other elements such as pie charts, map, info box and rounded pin elements. 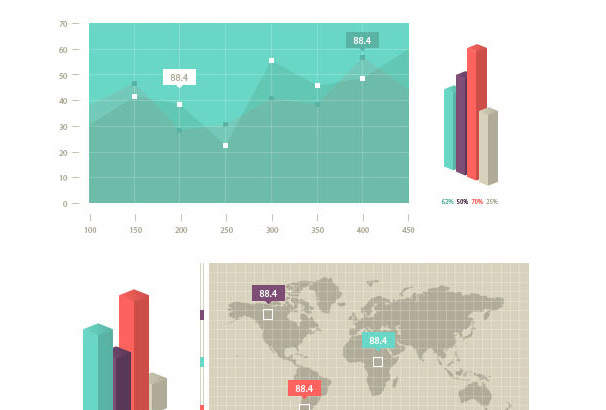 Create premium quality charts, maps, graphics, icons, timelines, layers and other visual graphics with the assistance of this multi-functional high quality template. 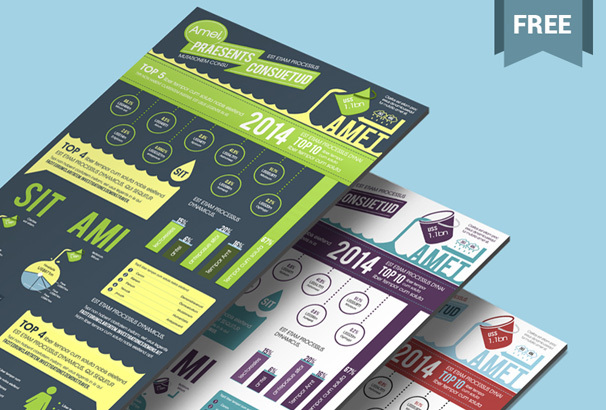 Took me a while to find a good website with infographic templates and such. Well glad i stumbled on your site and ill be happy to bookmark this and come back to see the others you have.